400 Calorie Fix, was created by Liz Vaccariello, who is one of the health experts at Prevention Magazine and author of the Flat Belly Diet. It is a calorie-controlled eating plan that lets you eat your favorite foods and still lose weight. Vaccariello says that she came up with the amount of 400 calories after consulting with dietitians who advised her that this is enough calories to help you feel full and prevent cravings, while also allowing you to get an adequate amount of nutrients. According to a recent Television show, one woman has successfully lost six pounds in just two days by following the 400 Calorie diet. Dieters are told that weight losses of up to eleven pounds in two weeks are possible. The basic concept of the diet is simple: eat three or four meals a day, with each meal consisting of 400 calories. You still get to eat all of your favorite foods but you just have to be aware of monitoring your portion sizes. 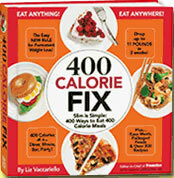 The author says that the goal is to “start retraining your mind to see food the 400-calorie way”. If you want to kick-start weight loss you can start with the 2 Week Quick Slim, a 14-day meal plan. By eating small frequent meals throughout the day you will feel satisfied as well as keep your metabolism fired up all day. Included in the book are 400 ideas, recipes and tips for what to eat at home, when dining out and in fast-food restaurants. All of the recipes and meal suggestions are designed to satisfy your visual need for a large serving of food. Foods containing monounsaturated fats, such as nuts, olives and avocado, are included in the recipes because they help to increase flavor and make the meal more satisfying, which reduces your appetite all day long. High protein foods are also emphasized because they stimulate hormones and neurotransmitters that signal fullness. The recipes in The 400 Calorie Fix are categorized into groups with each recipe assigned a colored star that indicates the main nutrient in the meal. If you collect a star from each of the four groups every day this will ensure that you meet your nutritional requirements. Blue star recipes contain at least twenty grams of protein. This helps to build muscle and increase calorie burning. Red star recipes contain monounsaturated fatty acids. These meals will reduce your appetite, support healthy cholesterol balance and reduce your risk for diabetes. Orange star recipes contain more than seven grams of fiber, which reduces your absorption of fats. Green star recipes are those that include at least one cup of fruits and vegetables. These foods are important to ensure you are getting enough vitamins and minerals. Fruit, vegetables, chicken, turkey, beef, eggs, shrimp, nuts, olives, avocado, hummus, pasta, bread, rice, reduced-fat cheese, skim milk. Exercise is not a requirement of the 400 Calorie Fix Program. The 400 Calorie Fix retails at $31.95. This includes a bonus of three Prevention health reports on ageless beauty, natural medicine and exercise for weight loss. Simple, convenient and easy to follow. Can be used with any food or meal plan as long as you follow the basic rules of the diet. Will not disrupt your social life. Requires monitoring of calories and portions. Encourages the consumption of fast-foods. May be difficult to estimate the calorie content of some foods. Promotes unhealthy weight loss expectations. Not a particularly new approach to dieting. The 400 Calorie Fix offers a simple approach to a calorie-controlled diet that allows you to continue eating your favorite foods as long as you stick to the basic rules of the diet. It will appeal to dieters who prefer a weight loss plan that has both structure and flexibility and will not interfere with their social life. I understand that there is a cookbook available also…do I need this? Weight comes off slower than suggested but I’m eating the 4 400 calorie meals. Have lost 8 lbs easily, I could do this diet indefinitely. I am definitely going to try this out. and to rian, i have seen this diet and it hardly has any processed foods. and i think you are missing the point of the diet!!!!!!! Wow, this is a very unhealthy diet full of processed foods. I’d steer clear.